What started as a one-off commission has ended up being Lowden’s very first production solidbody electric. Does it have the magic of the Downpatrick company’s acoustic models? When Snow Patrol’s Gary Lightbody was approaching his 40th birthday, his friend Ed Sheeran wanted to pay him back for the Baby Lowden acoustic Gary had previously given him. The Lowden has become one of Ed’s favourite instruments, so he wanted to get Gary a very special guitar in return. As such, he gave George Lowden a call, and asked him if he could build a solidbody electric. When the biggest pop star in the world asks for something, you’re inclined to say yes, but as it happened, Ed’s order came exactly 40 years after George had built his last electric – and he had only ever made four – so why not revisit the concept? The first prototype exceeded George’s expectations, but it took about a year and a half of careful consideration to get to that point. 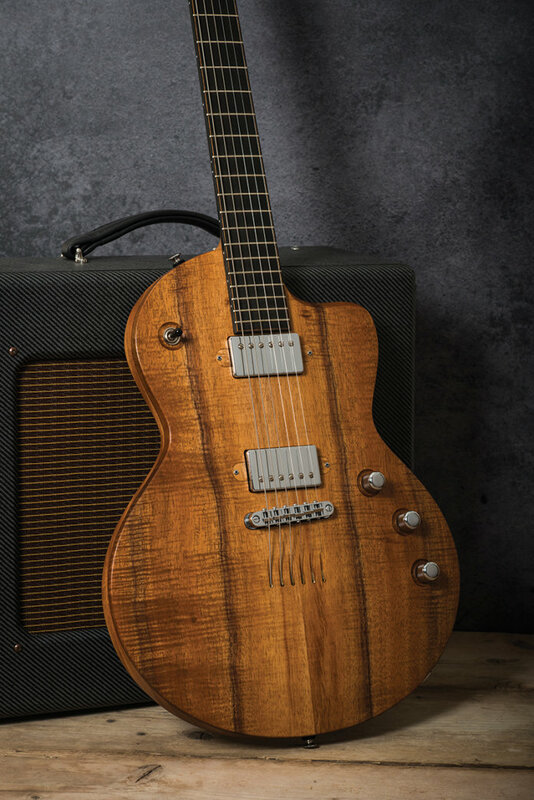 Sheeran was so knocked out with the results that he ordered another for himself, and soon after, George decided that an electric should be added to Lowden’s line-up, and here it is. 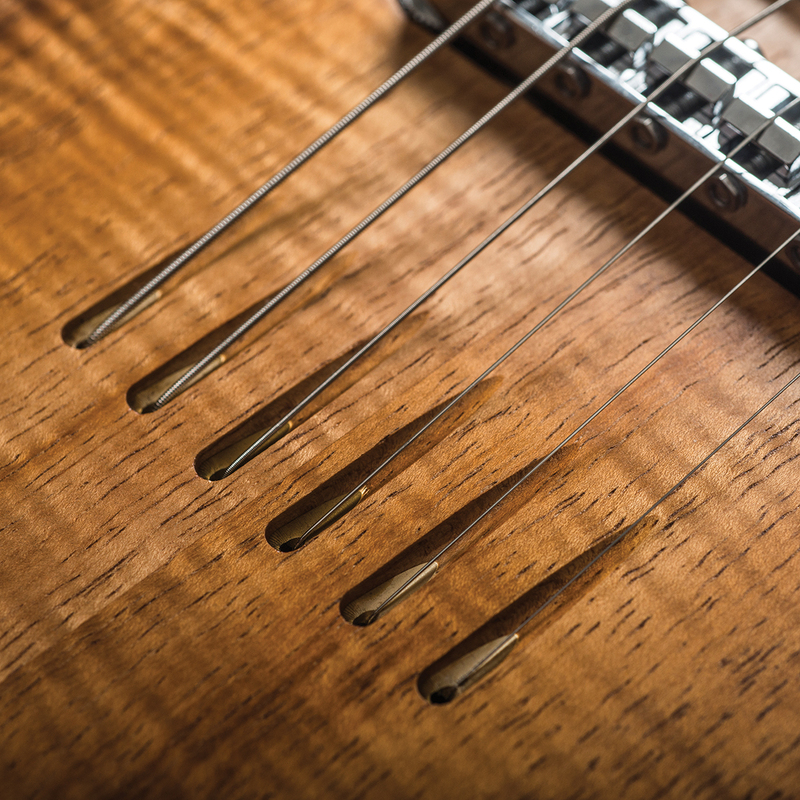 From Martin to Taylor, Godin and Collings, various big-name acoustic manufacturers have attempted to turn their hands to electric instruments over the years, but the results have been mixed. Although they were a commercial flop at the time, Martin’s F-Series and later GT-Series models now look oddly contemporary in a boutique sort of way, but the less said about the E-Series models the better. 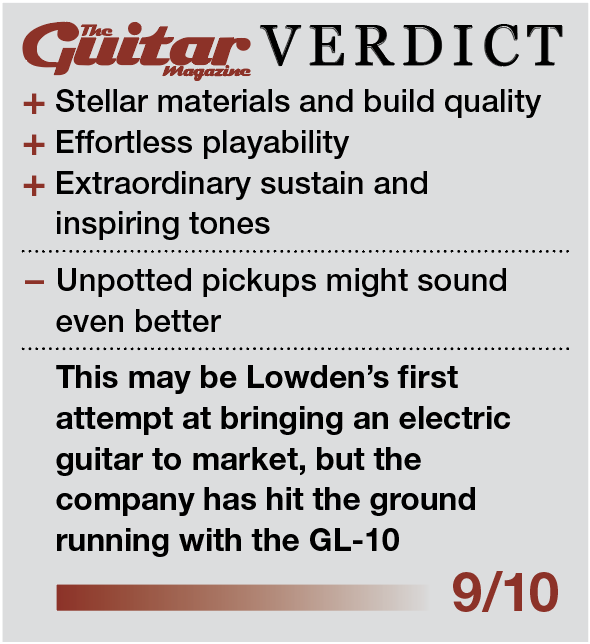 However, it must be said that of all the great acoustic guitar makers, Lowden is the last one we expected to ‘go electric’. And yet here we are with a bona fide solidbody, featuring Lollar Imperial humbuckers, a Gotoh bridge with individually adjustable saddles and conventional controls. 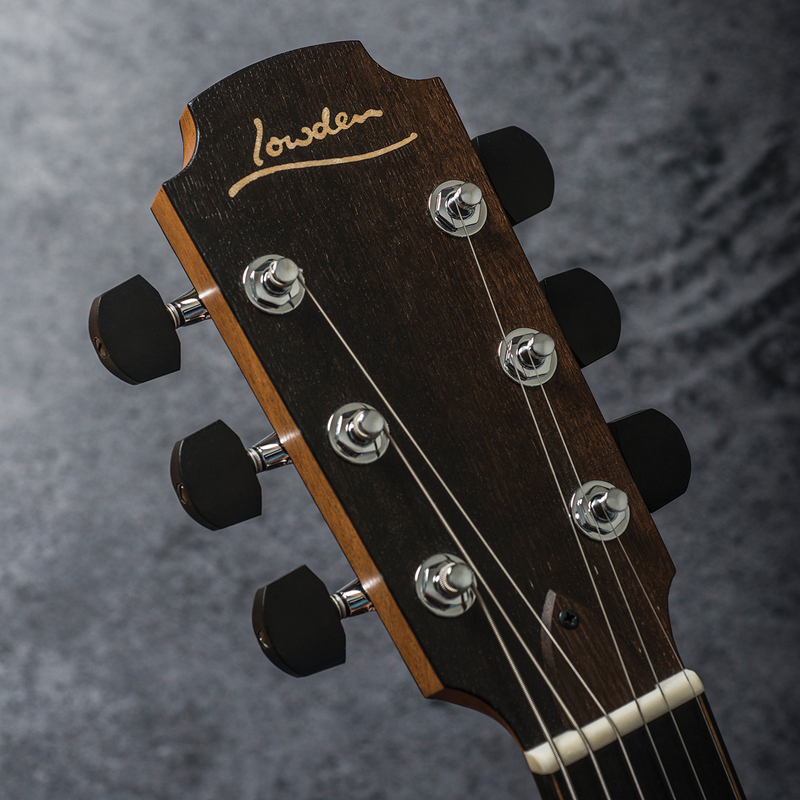 Despite all this, even if there was no name on the headstock by which to identify it, nobody could mistake the GL-10 for anything other than a Lowden. The body outline is not dissimilar to Lowden’s S-Series acoustic models but the depth is minimal, even by solidbody standards. This ‘thinline’ appearance is emphasised by a slight tummy tuck and a carved taper at the heel that reduces depth by about a third to ease access beyond the cutaway. Factor in the arched top and the chamfered cutaway, and the effect is sculptural, comfortable and ergonomic. ‘Pancake’ bodies are frequently cited as examples of compromises in quality during Gibson’s Norlin years. Clearly George Lowden didn’t get the memo, or maybe after 40-something years of guitar building he’s learned more about resonance than most? We’ll find out later, but GL-10 bodies comprise three layers, with one-piece mahogany backs and a middle section of either rosewood or maple. A choice of top woods is available and our example has bookmatched koa with stunning lateral flames. 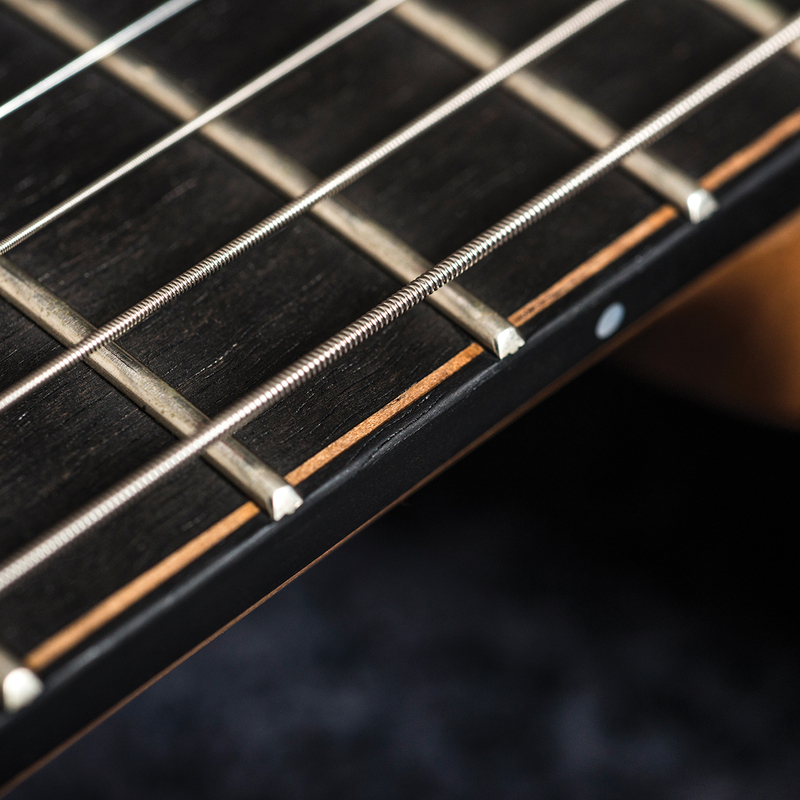 The pinless bridge is another longstanding Lowden acoustic feature and here something visually similar is achieved with through-body stringing. The string holes are lined with solid brass and an ‘tonal brass plate’ embedded into the rear of the body to retain the ball ends. This ‘embedded’ theme extends to the sunken bridge, switch and knurled Telecaster-style knobs. 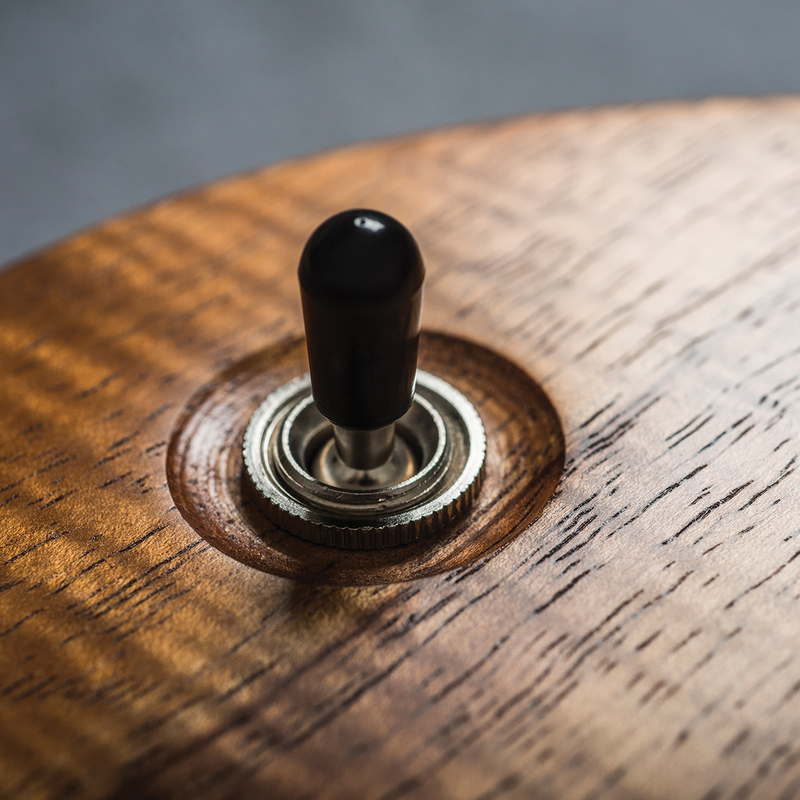 There are CTS-shaped recesses for the two volume and master tone pots, with a channel for the ground wire that links them hidden under a walnut cover plate. 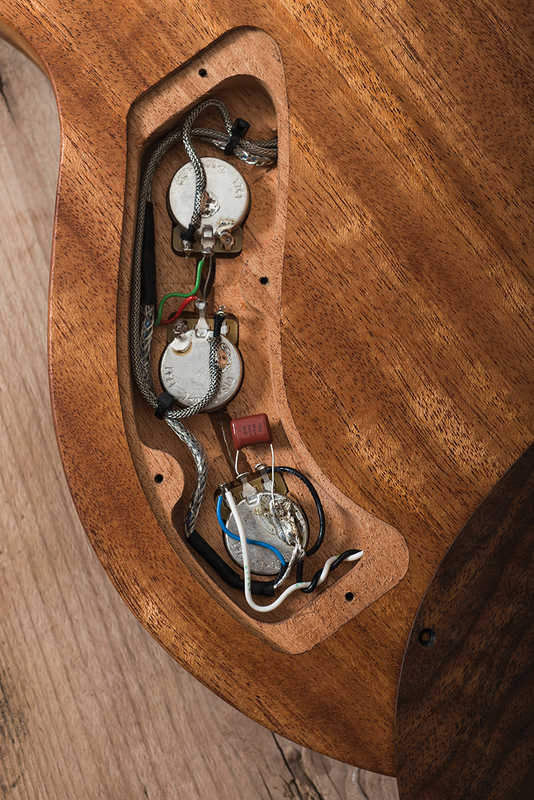 Even the pickups are recessed, in a sense, with exquisitely fitted koa caps screwed in place over the ‘ears’. These can be removed to adjust pickup height and then replaced. The five-piece mahogany/rosewood neck features front and back bog oak headstock veneers (carbon dated to 3300BC) with Gotoh 510 tuners and ebony buttons. 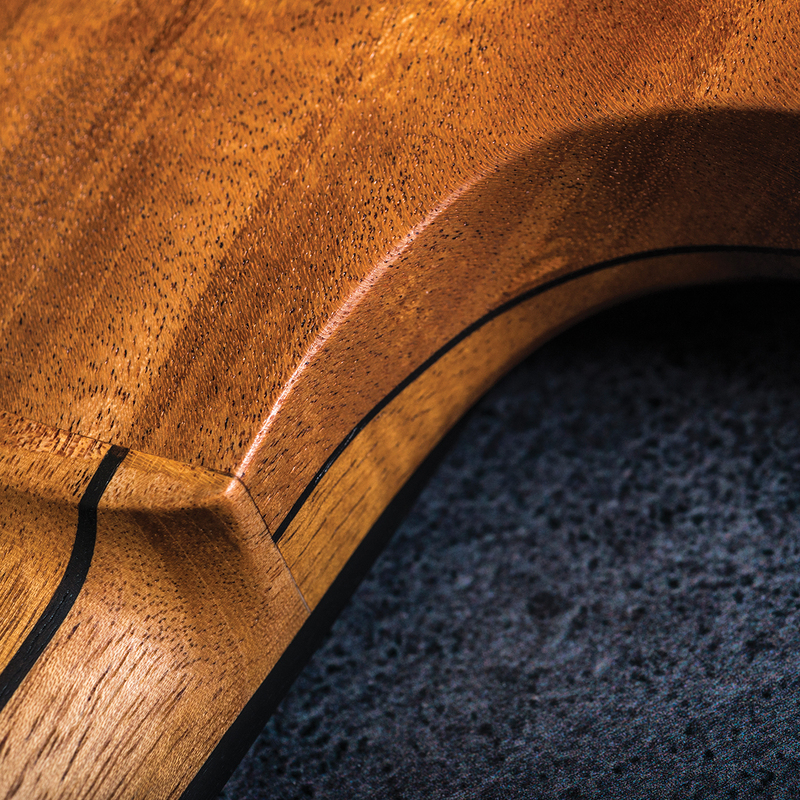 The lipped volute finds an echo at the heel, which fits right into the crook of your hand as you reach the 22nd fret. The neck has a reasonable degree of heft, but it doesn’t feel bulky at all and the C profile and depth remain very similar all along its length. If it wasn’t for the slim fretwire, the fairly flat fingerboard radius might give this neck a modern, shred-friendly feel – meaning it’s fast and consistent everywhere across the ’board. Since it’s a Lowden, you’d expect the GL-10 to impress unplugged and it certainly does. The tone is deep in the bass, airy in the treble and chiming clarity combines with sustain that can only be described as remarkable. It’s one of those solidbodies that you can feel resonating against your body as you’re playing it. Through force of habit we begin amped up testing by running through typical bluesy minor pentatonics, but without even being consciously aware of it, the GL-10 soon takes us off into more abstract and ethereal realms. Once this realisation dawns on us, we begin to consider why that might be, and keep coming back to that extraordinary sustain. Much like the stunning 1960 ‘Duggie Lock’ Les Paul Standard that we spent some time with in Vintage Bench Test a while back [visit theguitarmagazine.com/duggielock if you missed it, and check out Huw’s demo on youtube.com/theguitarmagazine – Ed] the GL-10 hangs onto notes tenaciously. We soon find ourselves hitting a low E or dropped D and using the bass note drone to underpin improvised lead lines, doublestops and sus chords that combine open and fretted strings. Without any need for effects to achieve harmonically rich and inspiring tones, we nevertheless feel almost compelled to turn up the reverb or reach for a delay pedal. There’s something tantalisingly atmospheric about the GL-10’s tone that lends itself to more abstract and ambient playing. Having said that, if you want a toneful blues rock guitar, the GL-10 can twang, sing, growl and roar with the very best of them. The acoustic resonance and the Lollar Imperials combine to create a big, fluid and articulate range of tones. We feel that the Lollars don’t quite bring out the full extent of the GL-10’s upper harmonics and dynamic range as a more microphonic set of PAF-alikes might, but as ever the trade-off is whether a totally unpotted pickup set would be compatible with your preferred level of gain. The GL-10 is an outstanding guitar. 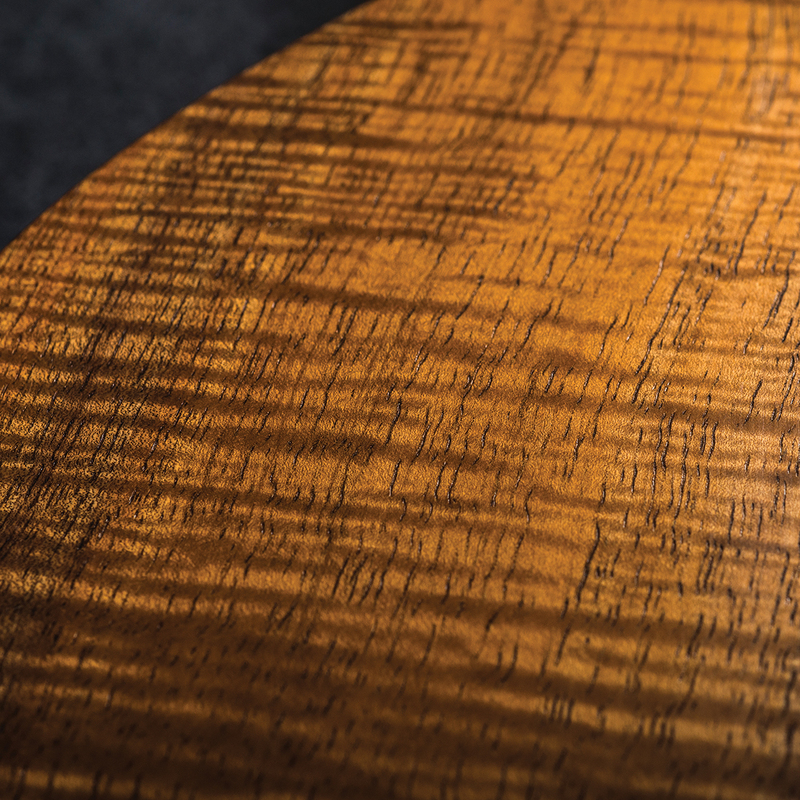 Compared to Lowden’s stellar acoustics, the standard of woodworking and materials has not been compromised. But it goes deeper than that. Lowden has somehow imbued the spirit of its acoustic models into this first attempt at designing a production electric, and that’s something special.